Hans Strand, born in 1955 in Marmaverken, Sweden. In 1990, after a nine-year career in mechanical engineering he decided to devote his life to landscape photography. Its a change he never regretted. Hans has always felt himself drawn to the untamed and unmanipulated emotions and expressions that he finds in nature. He often says: ”The wilderness is the mother of all living things. It is always true and never trivial”. Hans work takes him to diverse places worldwide; from polar deserts to steaming rainforests and expansive deserts. The internationally awarded landscape photography is seldom a portrait of a place, but an expression of forces that create and mold a landscape. Hispictures, frozen in a static frame, still tell a story of movement, time and evolution. Lately his photography has also taken a course away from the untouched and wild nature and focused more on people´s influences on ecosystems. Photographs of water pollution and the visual magic of manmade agricultural landscapes have become an important ingredient in his in recent work. Hans Strand is frequently published in international photo and art magazines and his work has created a worldwide following. He has won thirteen international awards, including the Hasselblad Master Award in 2008. He has published seven books, often with themes relating to the environment and peoples relations to nature and landscapes. Hans Strand cooperates with Zoom Fotoresor and Arctic Image. Hans Strand regularly holds workshops in Iceland, Greenland, Norway, Sweden and else where. Below you can find upcoming events and workshops. I have always been a lover of the subjective photograph. Whenever horizons are excluded the feeling of location is lost. It is then the poetry can take over and allow you to discover small wonders around your feet and make them into photographic art. The grand vistas may be impressive for the eye, but when it comes to photography you have less possibilities to make something personal from it. It requires mental balance to extract good compositions from the chaos of Nature. To organize geometry and structures in the viewfinder, is an intellectual challenge which makes my wheels spin. You have to take the landscape in and when you are one with your surroundings, all of a sudden you start to see compositions everywhere. There is an expression in Zen archery: If you are in the right spiritual mode, you will hit the centre of the target as an unimportant consequence. 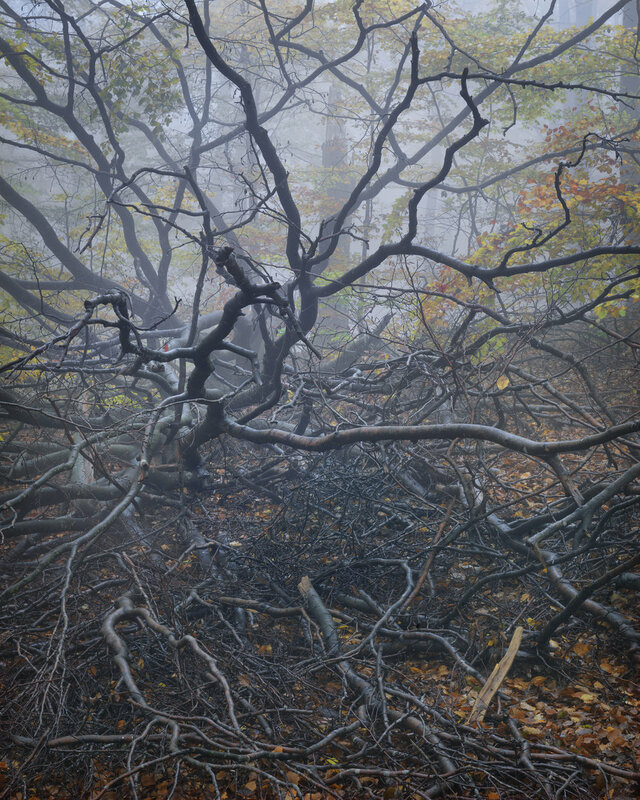 The forest is perhaps the most complex landscape you can photograph. Its chaos is a hard nut to crack, but just being surrounded by trees gives me a feeling of comfort which makes me both relaxed and concentrated. Sometimes a morning mist have stretched out a helping hand to organize my compositions. The mist fades the background and makes the images less chaotic. In ice and sand I have sometimes found almost mathematical order where repetition is making interesting patterns. The outcome of these close ups sometimes look like aerial photographs or even like samples viewed in a microscope. To me it proofs that the our world is fractal. Hans Strand has a strong affection for the polar regions. The wide expanses and a feeling of unfettered infinity inspires his photography. Nowhere on Earth are the elements presented so naked as in the Arctic and the Antarctica. Barren landscapes, ice fields and weather interact to create a relentless environment where beauty and one’s emotions are laid bare. For the human visitor it is a humbling experience – a frail existence at the mercy of Mother Nature. While the landscape is grand and sometimes overpowering, in the photographer it instills a feeling of creating minimalistic images. But the feeling of eternal beauty is a false one. Global climate change is a threat to the polar regions. The polar ice cap is melting in a warmer world, and already in this century the Arctic ocean will be ice free in the summertime. For polar bears and other animals uniquely adapted to a life in the polar regions, the future looks bleak. Destructive exploitation of resources like oil, gas and minerals, adds to the uncertain future facing the Arctic. In the face of such dire circumstances and prospects, Hans Strand’s photography has turned from the pristine nature to depicting Man’s influence on polar environments. Ever since man became Homo Sapiens we have manipulated and undulated the world we live in. The big changes came with the development of agriculture some 7000 years ago. The land around the Mediterranean Sea got deforested by man and great erosion problems started as an immediate consequence. The fertile soil was flushed away by rains and left was just bare rock. In Spain there was still soil enough which could be used for farming. The problem here was the lack of water in the dry climate. To use the land in the best way, farmers started to grow the crops during the winter season, this when the precipitation was enough the make the crops grow. They then harvested in the spring before the soil got too dry from the summer heat. In many areas of Spain this way of dryland farming is still practiced. It is a sustainable method, since no irrigation is used. Still the land is more or less completely consumed for farming. Specially in the provinces of Andalusia and Aragon there is almost not a single square meter which is not tamed and undulated by man and used for farming. This has resulted in huge monocultures. The diversity of plants which once grew here is erased and gone forever. From the air this land look both scary and fantastic at the same time. From an artistic point of view it is specially unique. The farm fields have taken on incredible shapes and patterns and you can easily make parallels to expressionistic art. The farmers, of course had no aesthetic intentions when they reshaped the land. The shapes of the fields are just results of the topography and the farming technics. My love affair with Iceland started in 1995. At that time Iceland had not yet become the fix star for tourism as it has become today and few photographers had been there. I spent 3 weeks driving around the island on bumpy dirt roads and did several hikes into the highlands. The beauty of the landscape blew me away. I realised that 3 weeks of photography was way too short time to do this fantastic country justice. As a result I have now made a total of 30 trips and spent almost a full year photographing the island. I have criss crossed the landscape with 4W-drives and spent 110 hours shooting aerials from planes and helicopters. I have tried to avoid the most popular tourist locations. This to make my own interpretations of a unique landscape. On top of all these planned photography, I was also blessed with the opportunity to photograph the eruption of Eyjafjallajökull in May 2010. An experience where the volcanic temperament of Mother Earth showed up right in front of my camera.